PingMag... Space Invader: The World Shall Be My Mosaic Tile by Aroldo Cardoso Jr. "...French artist Space Invader, or simply Invader, loves vintage video games so much that he uses their famous characters as motifs — for the mosaic tiles he puts up in the streets. Tiles? ...an interesting twist in street art, we dare to say. Especially since he has been physically mapping the world’s cities with his pixelated art for nearly the last ten years or so. But wait! 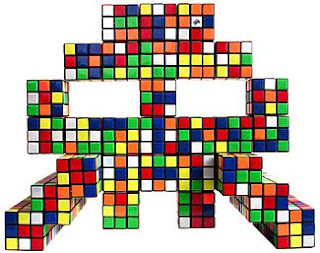 When he starts deconstructing the good old Rubik’s cubes for his artworks."